In 2010, Cooper-Hewitt held its fourth installment of the National Design Triennial series, featuring global design innovations that addressed environmental and social challenges. ProSolve 370e was among the projects displayed in the exhibition, selected because it represents a practical and elegant design solution for environmental needs. Since the exhibition, I continue to be drawn to the design for its sculptural form and visual complexity, seemingly inspired by the molecular technology it contains. The ProSolve 370e system consists of modular architectural tiles coated with titanium dioxide that, when activated by daylight, neutralizes nitrogen oxides—harmful for their effect on the respiratory system, acid rain, and ozone depletion—in the surrounding environment. While the antimicrobial and air-purifying effects of titanium dioxide have been known for years, it is the form and application of ProSolve that is particularly innovative. The tiles are designed for absolute material efficiency, exposing more surface area to daylight to activate the pollution-fighting technology. ProSolve is intended for installation as a functional, and quite topographical, element on an existing building façade, enabling the building to perform in ways other than initially intended. 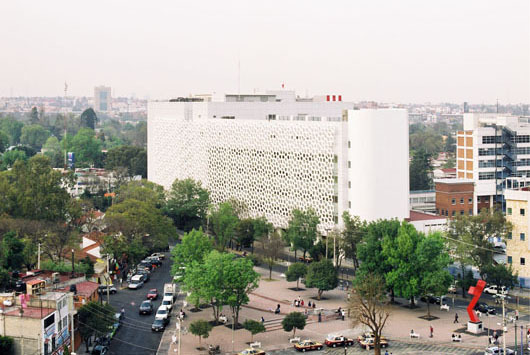 Most recently, ProSolve 370e was installed as an exterior facade on a hospital in Mexico City. The elegant, organic form becomes a memorable signifier on the building, reminding passersby of the city’s air pollution problem. ProSolve 370e architectural tiles. Designed by Elegant Embellishments, 2009. Gift of designer. 2011-29-1/44.